Back in 2012 we hit the road with Modeselektor to chart their journey to become one of Germany’s premier electronic acts, travelling with the duo across Mexico, Denmark, Belgium and beyond. 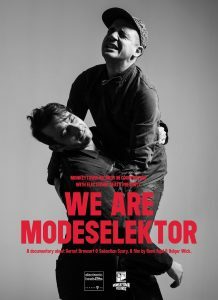 The result was the acclaimed ‘WE ARE MODESELEKTOR!’ documentary. Formerly only available on DVD and Blu-Ray, it can now be watched online and in full for the very first time, exclusively through the Telekom Electronic Beats TV channel. “An odd duo that raises international mass hysteria and has been creating a credible sound for years now – Modeselektor seems to be a phenomenon in itself.